NVidia Corp. #DOW #NK225 We’re scanning some popular US stocks, prior to their earnings reports. 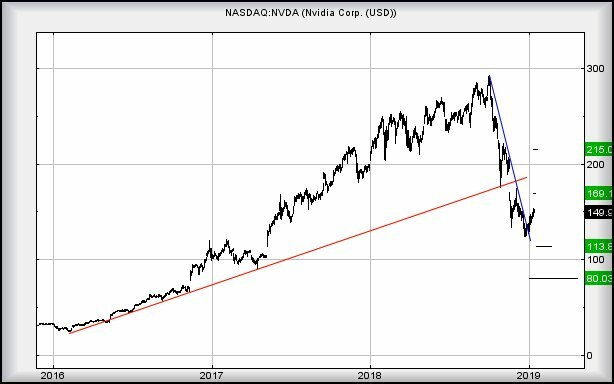 Traditionally, the US market exhibits a strong “buy on the rumour” tendency and with #Nvidia due to announce results in just under a month, there’s a fair chance for some logical movement near term. In the case of Nvidia, the company whose brand name apparently drives all our graphics cards, it appears optimism is possible. At time of writing, the share is trading around 151 and need only exceed 154 to enter a cycle, hopefully, to an initial 169. Surprisingly, closure above 169 is liable to exert considerable force on the price with a secondary target at 215 dollars. We’re fairly nervous about such a scenario, given the short timeframe until their results announcement whereas movement to 169 makes quite a lot of visual sense. Here ends the good news. When we zoom out and examine price moves from a bigger picture perspective, this is actually quite dangerous if the company opt to issue a negative report. Essentially the price could hit 113 in a blink but worse, if it were to find reason to trade below such a level, ultimate bottom is down at 80 dollars. We cannot calculate any target below such a point, so should 80 appear, a bounce is expected. For now, we suspect 169 shall make an appearance.